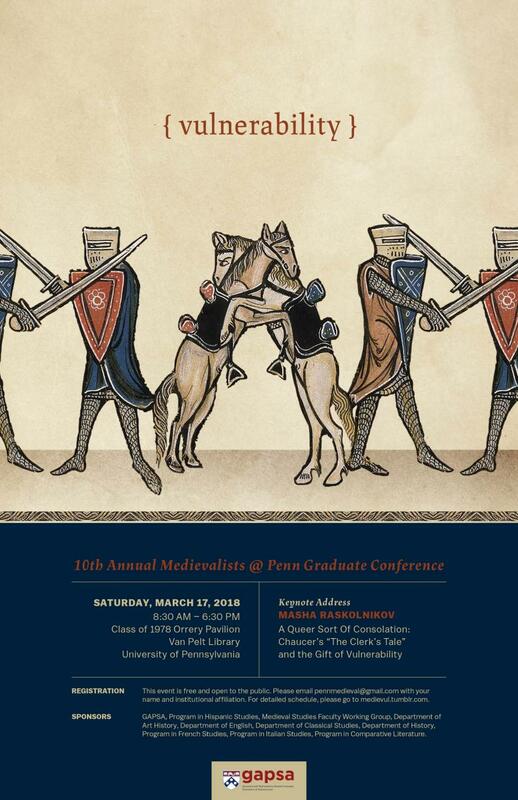 Everyone is invited to “Vulnerability,” this year’s installment of the Medievalists @ Penn Graduate Conference. Now in its tenth year, this fabulous full-day event is happening at the Kislak Center on Saturday, March 17th, 9 AM – 7 PM. All sessions will be held in the Class of '78 Orrery Pavilion, on the 6th floor of the Van Pelt Library, with a reception to follow at FBH. We’re anticipating that this year’s theme will be relevant to many, regardless of the period in which you generally work. Come and witness nine brilliant student presenters, decadent snacks, and a keynote address by Masha Raskolnikov (Cornell) titled: "A Queer Sort Of Consolation: Chaucer’s The Clerk’s Tale and the Gift of Vulnerability." This event is free and open to all. Please e-mail pennmedieval@gmail.com to register, or visit our website for more information: medievul.tumblr.com.